In Shaam, the 4th Imam (AS) gave a powerful speech in which he introduced himself to the people. He discussed his family, the Holy Prophet (SAW) and the Imams (AS) that came before him. He explained the virtues that they possess. He also spoke of the evils that occurred in Karbala. He spoke so eloquently that he moved the hearts of the people. Everyone was crying. At this point, Yazid knew he had to stop the Imam (AS)’s speech, because he knew that if he didn’t, the crowd would turn against him. To illustrate this question of Imam Zainul Abideen (AS), let’s make a family tree! *For our family tree, we used the outline of tree that I found here. we printed the image out poster-style so it was large enough to hold all the names. In cutting it out, we really regretted this choice because of all the intricate branches, but after it was finished, we loved the way it looked. 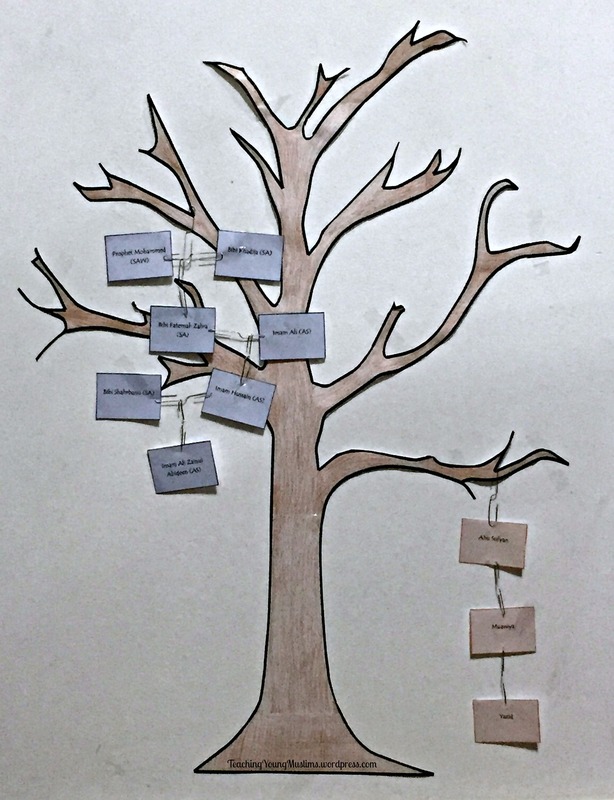 *To assemble the family tree, we used paper clips to connect the names and illustrate how they are all linked together. You could instead use a hole punch and some ribbon, or arrows drawn on another piece of paper and held to the names with tape. *Additional materials: scissors, a brown crayon, and LOTS of tape. Once all the prep work of the tree is done, all you have to do is cut out the names and assemble it! If you wish, you can forego the tree image entirely and use the names as flash cards to be assembled and reassembled as many times as you want. Repetition definitely helps learning!